Difference is what sets us apart from others in the world, and at Agnes Scott College, difference is also what brings us together. History: Founded in 1889, Agnes Scott College is an independent national liberal arts college for women, affiliated with the Presbyterian Church (USA). Location: Decatur, Georgia, six miles from downtown Atlanta; the campus consists of 24 buildings and an apartment complex on 100 beautifully landscaped acres. Diversity: Agnes Scott is an intentionally diverse campus; 61% of Agnes Scott students are students of color, and 6% are international. 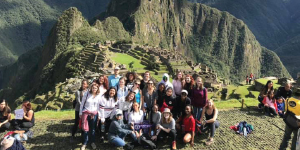 First-year travel: Nearly 100% of Agnes Scott students participate in a faculty-led first-year travel experience. Study abroad: Agnes Scott has partnerships with 123 universities in 35 countries. All Scotties are encouraged to explore the world around them. Internships: Almost 80% of Agnes Scott students gain experience through internships. Student life: More than 60 student clubs and organizations make it easy for students to get involved. Athletics: Six NCAA Division III varsity teams are available: basketball, cross-country, soccer, softball, tennis, and volleyball. More than 20% of students apply test optional. Named a “Most Diversified School” by Time magazine, Agnes Scott has long recognized that celebrating differences enables us to see the world from a wide range of perspectives. 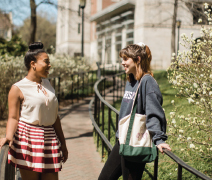 A member of Colleges That Change Lives, Agnes Scott will guide you down the pathway to becoming a more reflective, intelligent, and compassionate global citizen and a fearlessly confident future leader by the end of your four years of study. During your four years at Agnes Scott, you’ll grow as a person, discovering your strengths and building confidence. Through SUMMIT, our unique global learning and leadership development curriculum, you will choose a major, build leadership skills, and gain global perspectives, all while guided by a custom Board of Advisors. As a Scottie (as Agnes Scott students are called), you’ll spend four years with brilliant women who won’t suffer fools, stand for injustice, or tolerate prejudice; confident women who never settle; women who question, confront, and debate. You’ll study with professors who will help you when you call, push you to the limits, and then challenge you again. Our faculty members garner international attention in their areas of expertise, but their focus is on you, their undergraduate students. If you’re seeking a place where curiosity meets exploration, this is it. If you want a place where strength, honor, and compassion are melded into leadership, this is it. If you are ready to advocate for what you believe in and be immersed in a culture that cares about scholarship, this is it. If this interests you, read on, future Scottie. Agnes Scott embraces the liberal arts approach to learning. If you’re the kind of student who enjoys your studio art with a side of chemistry or who is passionate about medicine and literature, we think you should explore both. As a student, you’ll read and learn as widely as possible and then discuss and debate new ideas, guided by professors who will expect a lot and push you to be your best. You’ll also have a chance to put what you learn into practice, either as one of the 68% of Agnes Scott students who complete mentored research or the almost 80% who complete an internship. You might present at an academic conference, either one in your field or at our Spring Annual Research Conference (SpARC). And if our many academic options don’t cover a subject you want, you can cross-register for a class at one of the 20 other colleges and universities in Atlanta—for no additional charge. Our alumnae follow their passions all the way to the top, whether that means summiting the highest peaks on each of the seven continents; leading a Fortune 500 company; serving as a chief justice; winning a Pulitzer Prize, Oscar, Grammy, or Tony Award; or starting a mobile bookstore. Interested in graduate school? Since the 1920s, Agnes Scott has been in the top 6% of American colleges whose graduates go on to earn PhDs or a terminal degree in their field. With a 95% graduate school acceptance rate (including medical and law school) in the Class of 2017 and over half of our recent grads securing job offers prior to graduation, our graduates are ready to take on the world as soon as they walk across the stage. There is no limit to what an Agnes Scott graduate can accomplish. Our alumnae often refer to their Agnes Scott experience as transformative. That’s the power of a small liberal arts women’s college in a large metropolitan city. 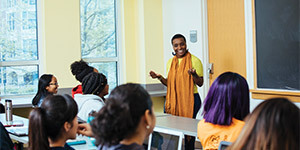 The SUMMIT curriculum, which earned the College the designation as the #2 “Most Innovative Liberal Arts College” in the country by U.S. News & World Report in 2018, is a unique learning experience only available at Agnes Scott. SUMMIT allows every student to dive into a core curriculum focused on global learning and leadership development that integrates course work with experiences in Atlanta and around the world. This ensures all our students, regardless of major, are prepared to become leaders in our global society. Successful leaders are prepared by strong mentors and broad social networks. That’s why all Agnes Scott students work with a team of advisors, including a SUMMIT Advisor, Peer Advisor, Major Advisor, and Career Ally. Your personalized Board of Advisors will help you adjust to college and design an educational plan that will prepare you for postgraduate success. Your first year will include foundational courses in global learning and leadership development in addition to an immersive leadership retreat during orientation. In the spring, you’ll also go on a week-long, faculty-led global immersion experience to locations like Northern Ireland, Ghana, New York City, and Martinique. The cost of this travel experience is included in Agnes Scott’s tuition, making it a possibility for all our students. After your first year, you’ll have a choice to make—you can opt to study global issues or leadership more fully, or you can study both. Or neither. No matter which option you choose, your Board of Advisors will guide you along the way, and you’ll have a portfolio documenting your experiences. While on campus, our students enjoy a vibrant living-learning community within our 100-acre tree-filled campus. The beauty of our campus is so notable that more than 30 movies and television shows have been filmed at Agnes Scott. But even better than studying among our stunning Gothic architecture, through your involvement in our time-honored campus traditions and student organizations, you’ll forge lifelong friendships while living in close proximity to more than 930 brilliant, diverse women. The Agnes Scott campus is located in Decatur, Georgia, an intimate community just six miles from downtown Atlanta. Our students enjoy the Decatur Square, just a short walk from campus and filled with great restaurants, local shops, concerts, and a MARTA station (Atlanta’s public transportation system). A short train or car ride away, Atlanta offers so much to Scotties, from internships and concerts to shopping, cultural attractions, and the world’s busiest airport. With 16 Fortune 500 companies headquartered in the Atlanta area (including four Global 500s) and an airport that offers direct flights to 150 US cities and more than 50 countries, the world is easily within your reach. If you’ve read this far, why not plan a campus visit? We’d love to meet you, and you deserve a chance to see campus for yourself! Schedule your campus tour or an overnight visit today at agnesscott.edu/visit.